Because of their professional expertise, it makes sense that accountants would pay close attention to their own money, and would be very involved in the investment process related to that money. Those perceptions are generally backed up by the research in Spectrem’s Professional Series study on investors who make their living keeping track of other people’s money. Spectrem’s qualitative and quantitative Professional Series looks at accountants as investors and compares them to affluent investors in other professions to determine just what advisors are working with when they contract with accountants. It also includes conversations Spectrem had with a number of accountants, discussing their investment behaviors and mindset. Compared to other investors, accountants are less likely to pool finances in a household and less likely to make financial household decisions jointly. Accountants have a high level of concern over the national debt (probably because they understand it better than other investors) and Ultra High Net Worth accountant investors with a net worth over $5 million have a very high level of concern over government gridlock. Considering their profession, accountants probably spend a portion of their workday considering what government is doing, or not doing, to make their lives easier, or more difficult. In both cases (national debt and government gridlock), advisors can work with accountants to ensure their personal investments align with current events related to those two controversies. 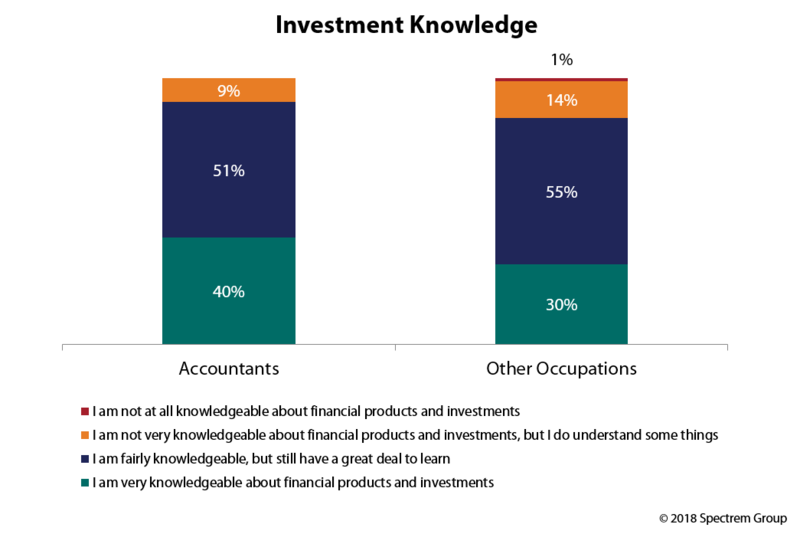 Accountants are notably more knowledgeable about finances and investment products than investors from other occupations. Forty percent of accountants consider themselves to be very knowledgeable, and 51 percent place themselves in the category of knowledgeable. While 79 percent of all accountants use a professional financial advisor, that percentage climbs to 90 percent among the UHNW accountants. While 42 percent of all accountants use a Full Service Broker as their primary advisor (well above the 33 percent of investors from other occupations), 5 percent use an accountant to serve as their primary advisor. All of that being said, accountants are unusually supportive of the idea of using robo-advisors, which might seem odd, since accountants are probably victims of technology taking away business as online accounting services flourish (especially at tax time). Thirty-six percent of accountants believe a robo-advisor can do the job as well as a human advisor when it comes to picking insurance plans, and 28 percent think the same thing about retirement investing. Are accountants and financial advisors comrades or competitors? There are certainly situations in which an advisor client needs to speak to an accountant on tax issues, and times when an accountant client could use the wisdom of a financial advisor. But accountants do use financial advisors when it comes to investment decisions, and an accountant client can be a very knowledgeable client when it comes to money management. Be prepared for a detailed conversation when dealing with an accountant client. Keep in mind, also, that accountants are gatekeepers. They know when their own clients need investment help and are likely to want to turn their clients over to a financial advisor they can trust. Your goal is to be that advisor.